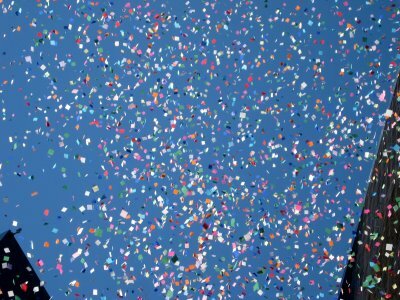 I just heard from Amanda Bergeron, my indefatigable editor at HarperCollins, that When We Were Strangers has sold 3,100 ebooks, a record which she says means “confetti needed.” I’ve got none handy but tonight when our house fills up with local Italians and Italo-philes for our “Cinema Sotto Le Stelle” (cinema under the stars) home-made film festival with pot luck dinners and recent Italian releases shown on our deck, we’ll celebrate this. But back to ebooks and writers, there’s the plus that the return is slightly more on ebooks than on “real” books (about 15 cents in my case). But there’s the minus that potential readers can’t read over someone’s shoulder or see the cover and ask if it’s a good book and (let’s hope) hear yes and go buy it. But the big deal for me is that there’s less chance in an ebook world for “sightings in the wild,” that electric moment when you are sitting at your gate at the airport and see someone actually reading your book, holding it in their hands, turning the pages, maybe (oh sheer delight) walking with it, reading. Naturally, there’s the down chance they toss it and pull out the National Enquirer, but still, you saw your work in a human hand. Now this probably happens to Stephen King every day, maybe even in checkout lines at the grocery, but the first time still must be something. A friend told me she saw two (2) people in a Starbucks with When We Were Strangers, but darn, I don’t go to Starbucks. So I wait for my first “sighting in the wild” — seeing someone else following my Irma through her journey.